1. Ukip does well only when it is in the headlines. Like all small parties, it needs as much publicity as possible to give the appearance of momentum. Ukip hasn’t had this since the Newark by-election in early June; its share in opinion polls has slipped accordingly. But now the party is back in the headlines and will remain so until the by-election in Douglas Carswell’s constituency of Clacton is held. By chance or design, this period will coincide with party conference season. An opportunity for the main parties to concentrate solely on firming up strategies and firing up supporters has been undermined, and Ukip has ensured it will be present at each of the conferences if not in person then definitely in spirit. 2. The political calendar of the next couple of months has been shaken up. We were due a sequence of known high-profile events: the House of Commons returning on 1 September; the TUC Congress from 7 September; the Scottish referendum on 18 September; Labour’s conference from 21 September; the Tories’ conference from 28 September; the Lib Dems’ conference from 4 October. Now there is an unknown factor. David Cameron has said he wants the by-election “as soon as possible… for this reason: people in Clacton voted not just for Douglas Carswell, they voted for a Conservative government, for a Conservative member of parliament.” But how soon is “soon”? Will the Tories try and schedule the contest before or after their conference? 3. The prime minister is going to have to decide on an anti-Ukip strategy now, rather than at the general election next spring. Plans will need to be brought forward. Polling and focus groups will have to be rescheduled. Most pressing of all, a candidate will have to be found. What sort of person would be best for the job? Brian Wheeler and Iain Watson for the BBC think the Tories will “have to trawl their membership lists to find another Eurosceptic to take on Mr Carswell.” George Eaton of the New Statesman argues precisely the opposite: the candidate should be a moderate, someone who can win tactical support from centrist voters (as possibly happened in Newark). Boris Johnson might have been the ideal person to stand for the Tories. But he continues to give the impression of being more interested in helping himself than his party, confirming this week that he intends to try and stand in Uxbridge & South Ruislip. 4. Clacton’s constituents need to steel themselves for week upon week of outrageous photo opportunities, forests of election literature and battalions of politicians trooping down their streets. 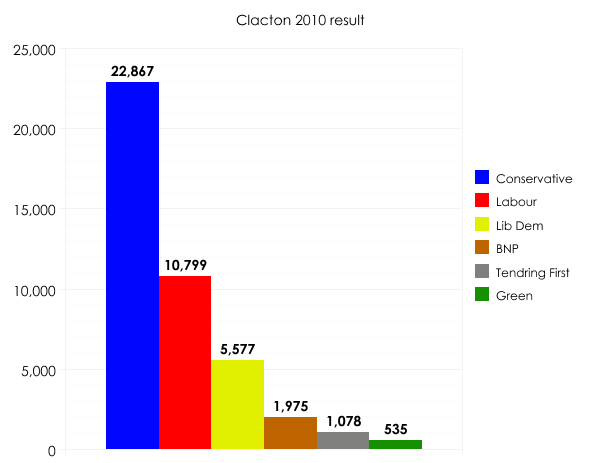 I can imagine the bustling, unselfconscious atmosphere of Clacton-on-Sea will suit the democratic circus quite well; less so perhaps the reserved communities of Frinton and Walton. Remember, Frinton did not allow its first fish-and-chip shop until 1992, its first pub until 2000, and fought for years to keep its 19th century level-crossing gates until Network Rail nipped in one night and removed them. The local paper also carries the views of a couple of locals who intend to vote for Carswell despite his defection. “I’ve seen him on Clacton beach with his sleeves rolled up picking up litter,” says 67-year-old Kay Lawlor. Now Ukip finds itself in charge of the constituency – for the time being. Carswell’s majority is 12,068. The seat didn’t exist before 2010 so it’s not possible to extrapolate backwards and see precisely how the various parties have fared over time. On notional boundaries Carswell achieved a 9.7% swing from Labour to Conservative in 2010. But Labour still won 25% of the vote at that election, and this, plus the 12.9% that voted Lib Dem, and the unknown number of Tory voters who will stick with their party, adds up to an outcome for this by-election that I think is far from certain. There must have been a certain amount of planning. Why now? To get UKIP back in the headlines. Why resign his seat with only 9 months to the next election? To keep UKIP in the headlines. Headlines for a few weeks are more valuable to UKIP than having an MP in the House of Commons until next May. This is a very insightful and interesting analysis. I for one forecast a UKIP victory in the by-election but I am sceptical about any further defections. Carswell was one on his own. It does feel like Carswell is heading for a win. It’ll be interesting to see who comes second – will the Tory vote collapse completely, allowing Labour to nip in front of them, or might there be enough support for the Conservatives to be runners-up?